In virtually every region of the country, there is a need that can be reduced by getting involved in community efforts. 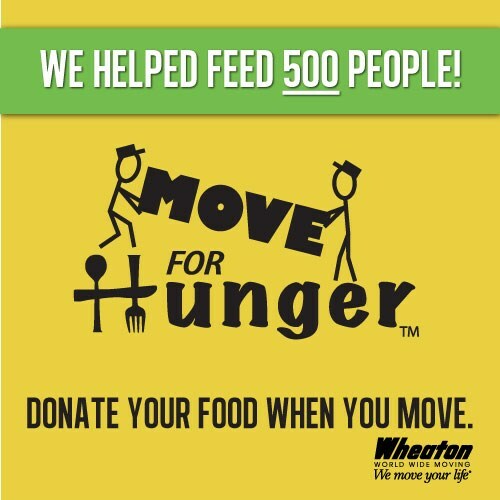 In collaboration with Move For Hunger, the Preferred Moving & Storage team continually works to provide for the hungry and make it easy for our customers and neighbors to help out. For years, we have been a Move For Hunger partner. This has meant getting the word out to our customers about just how easy, and fulfilling, it is to donate. As a professional moving company, we gladly utilize our resources – including local moving trucks, warehouse space and our dedicated crew – to collect non-perishable food items and deliver them to Gleaners Food Bank of Southeastern Michigan. Our customers have played an essential part, stepping up to give the food donations to our household movers – providing boxed foods and canned goods from their kitchens for our crew to deliver to the food bank. These donations have not only included a few unwanted foods from the back of the cupboards that may otherwise be tossed away, but more often grown to include multiple bags and boxes of quality consumables as the spirit of giving took hold. We would like to express our appreciation to everyone who has contributed. Together, we have reached a phenomenal goal: We helped feed 500 people! That’s 500 life-saving meals for those who needed them most. That’s 500 fewer nights of hunger for children and adults in our neighborhoods. That’s a meaningful accomplishment by everyone involved. And that’s going to remain a big milestone as we work toward the next 500.